Yesterday night, after making a vain attempt to clean up some random files on my trusty iBook, I came across this destination article that I wrote for a now-defunct magazine called Travel Savvy. The piece never did see the light of day-the magazine folded in 2005, just days after I submitted it to my editor-and until now it’s just been languishing in my computer’s hard drive. Sure, the piece is long past it’s newsprint prime (the references and locations almost certainly outdated), but I still feel that it might be worth publishing here in the blogosphere. 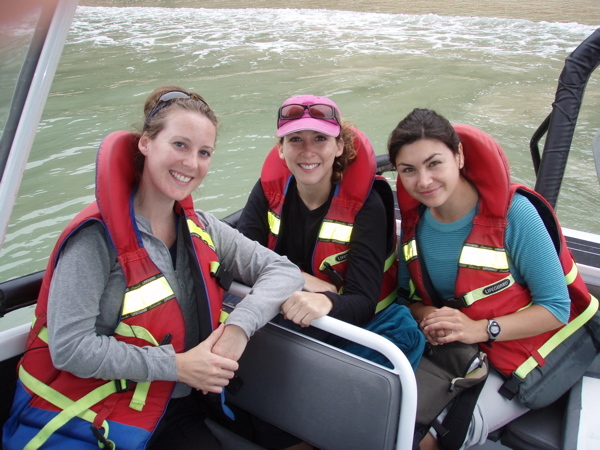 It recounts the unforgettable, life-changing adventure that brought Holly, Jen and me together as friends, and convinced us that quitting our lives to travel the world might be one of the best decisions we could ever make. We could hardly have imagined back in 2005 just how fully that promise would pan out. Shortly after sunrise, at an hour when Buenos Aires’ young clubbers are just drifting off to dreamland and local shopkeepers have yet to prop open their doors, the Armani and Gucci-clad crowd at the Alvear Palace is already awake and fully-caffeinated. The French style bosserie, or lobby bar, at the hotel’s heart crackles with kinetic energy as power players consummate business deals and lovers plan their next liaison over coffee. I’m perched at the gleaming oak and marble bar, draining my second cappuccino and flirting with the handsome Argentinean who bought it for me. Christian, as he’s introduced himself, is in his late 20s with dark, soap opera star good looks and a grasp of English so limited, I feel remiss for not reviewing my Spanish on the plane ride down. I struggle to respond, but my hesitancy has nothing to do with verb conjugation. Christian, like many people I’d come to meet during my trip, genuinely wants to understand why I’d grabbed my two best friends and hopped an overnight flight to his city, the political capital and emotional epicenter of Argentina. One pragmatic answer (and the most unromantic) was that Buenos Aires had never been more affordable. Argentina’s currency underwent a financial correction in 2002, effectively slashing the cost of goods by two-thirds and turning Buenos Aires into a modern day El Dorado. But instead of streets paved in gold, luxury-seeking Americans could find sumptuous steak dinners, handmade cashmere sweaters and finely crafted leather shoes for a tiny fraction of what if would cost them back in the states. Rumors of this “mythical” city-all the romance of Paris and chic style of Italy at rock bottom prices-had blown like seeds to the north, pollinating the minds of those unwilling to pit their anemic greenback against the all-powerful Euro. But while my friends and I had each packed near-empty suitcases in anticipation of unrestricted shopping sprees, we hadn’t made a sub-equatorial journey in search of a budget European substitute. Only two percent of American women have ever traveled to South America, and we thrilled at the prospect of having a cosmopolitan city all to ourselves. Without hordes of other American tourists spoiling the fun, the odds that we might saturate ourselves in local culture seemed to be in our favor. Now, as I sip the last of my cappuccino and gazed back at my handsome breakfast companion, I realize that I was right to trust my instincts. 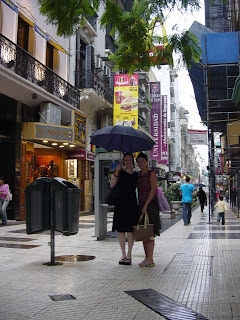 Three days earlier, after a surprisingly painless, jet lag-free flight, Holly, Jen and I had touched down to balmy mid-summer weather in Buenos Aires, turning New York’s latest blizzard into little more than a chilly memory. 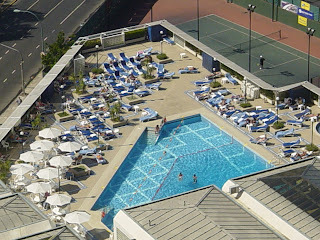 To completely evict thoughts of wool gloves and frostbitten toes, we checked into our room the Sheraton Park Tower, located in the central neighborhood of Retiro, and made an immediate break for the rooftop swimming pool. There, under the much-missed midday sun and over sherbet colored cocktails, we discussed strategy for the days ahead. None of us particularly cared go landmark hopping, and we were certainly in the right city for avoiding that. While Buenos Aires is near limitless in its offerings, a well-established circuit of monuments, statues and historic buildings isn’t among of them. The above-ground crypts at Recoleta Cemetery, housing the final resting place of Eva “Evita” Peron, the beautiful Belle Epoch opera house of Teatro Colon and the President’s “Pink House” (the country’s answer to our own White House) are all noteworthy attractions, but can be checked off a sightseer’s list in a single afternoon. Instead, the girls and I wanted to stroll, sip and shop our way through the city’s best attractions, the distinctive and colorful mélange of neighborhoods that compose it. While the city center where our hotel is located is primarily dominated by office buildings and banks, the outdoor shopping promenade at calle Florida gave us good reason to stick around the neighborhood. Even on a weekday in mid-summer, the mile-long pedestrian mall was teaming with life. We the soon discovered that the El Dorado version of Buenos Aires was more than just a myth-stacks of100 percent Patagonian cashmere sweaters were $30 each, buttery leather trench coats, $100 apiece. If you could abide the over attentiveness and soft sell of the shopkeepers, you could round out your winter wardrobe for a song. 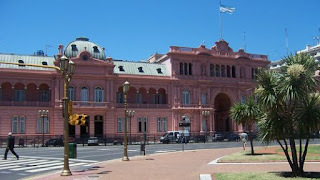 Like most Americans, PorteÃ±os (as the residents of Buenos Aires are called) have a boundless passion for shopping malls. Just off of calle Florida’s main drag, we discovered one of the city’s most popular. The multi-tiered, glass and frescoed palace of Galerias Pacifico housed studio-sized versions of the major label shops Lacoste, Nike, Polo and Yves Saint Laurent, plus at least 100 smaller boutiques. In addition to cut rate prices on most goods, tourists who present their receipts and passports to customer service offices could get lunch, coffee and their purchases delivered to their hotel-all free of charge. The girls and I soon realized that clothes this cheap came still came a price-last-season’s styles and inferior fabrics. Deciding we could fare better across town, we jumped into a Radio Taxi (the city’s most reliable cab company) and made a beeline for the shopping district of Palermo. 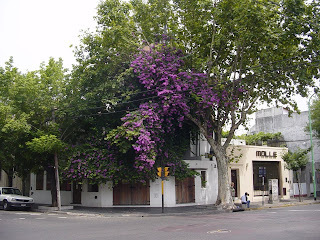 As we drove, skyscrapers and multilane highways soon gave way to the green spaces, cobbled streets and bougainvillea-draped balconies in this bohemian-chic neighborhood, one of the few spots in Buenos Aires to thrive in defiance of the economic downturn. Palermo itself is actually composed of seven distinctive districts, but the two that intrigued us most were Palermo Soho and Palermo Hollywood. The former offered a funky collection of outdoor cafes, progressive art galleries and trendy shops, while the later played host to a cluster of TV studios, restaurants, bar and the beautiful people who frequent them. Jen, Holly and I couldn’t believe it when our cab ride clocked in at just under $3, and for the first time that we could remember, we fell over ourselves trying to pick up the tab. Why not be generous when the cross-town fare cost less than a Starbucks latte? Immediately, it became clear that we’d come to the right part of town. The fashions were urban and edgy, the designs unique and stylish, and prices, while a bit higher than those along calle Florida, still far less expensive than those in boutiques back home. At spots such as Corazon Contento and Sora, the designers themselves were the ones behind the counter, happy to answer engage in conversation about their work. We return back to hotel loaded down with packages, and for the first time, felt what I now refer to as “shoppers high.” Just minutes after arriving in our room, I was already thinking about my next retail conquest. Argentineans have a reputation for being insatiable carnivores, and on our second night in town, we were determined to discover what drove this bloodthirsty obsession. We ventured to San Telmo, an atmospheric neighborhood lined with colorful, crumbling old buildings reminiscent of the city in an earlier era. Along one of the quiet cobblestone streets, we found La Brigada, one of the local’s most beloved parillas, or steakhouses. 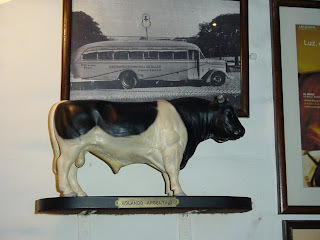 A veritable shrine to both beef and soccer, the bi-level restaurant is filled with memorabilia of the real men of Argentina: gauchos (cowboys of the Pampas) and goalies. 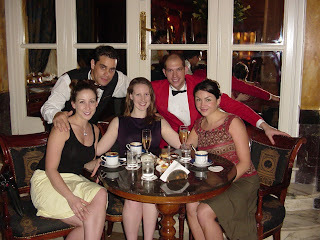 Having delayed our meal until the time when PorteÃ±os eat-nearly 10:00-Holly, Jen and I were ravenous. We ordered huge meal consisting red wine, salads, empanadas and seafood appetizers, all culminating in a thick slice of lomo, or sirloin steak. One bite of the juicy, tender meat told me all that I needed to know about Argentina’s vampire-like lust for beef, but I forced myself to leave room for dessert. Holly’s sweet tooth guided us towards a paper-thin crepe stuffed with dulce de leche, a thick spread made of caramel and sweet cream. With a single bite, a sugary new obsession was born. Our bill for the five-course meal: just over $20. We weaved through the streets of San Telmo until we approach Plaza Durreao, the neighborhood’s lively central square. 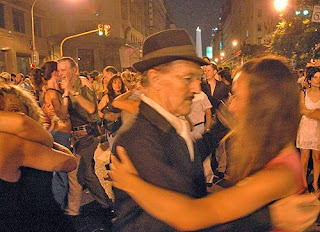 On most days this plaza hosts one of Buenos Aires’ most popular outdoor milongas, or dance parties, where the passion of the tango sweeps like a fever through the crowd of tightly embraced couples. Overeager hotel activity directors often guide their guests towards expensive, melodramatic, Broadway-style tango shows, but the best way to experience a true tango is at a millonga like the one held here. On Sundays, tango makes way for trinkets as the popular antiques market, Feria de San Telmo takes over the square, but tonight it’s thick with people watching some sort of loud, colorful dancing demonstration. One of the onlookers tells us that the holiday of Carnival is rapidly approaching and that each neighborhood in Buenos Aires holds it own parade to celebrate. Tonight show is merely practice for the main event. Back home, Sundays are made for brunching and we found that 5,000 miles to the south, things were no different. The Four Seasons Buenos Aires in the neighborhood of Recoleta promised the city’s very best champagne brunch so we dropped in to see for ourselves. We entered the turn-of-the century French-style mansion and ascended the dramatic marble staircase to an aqua washed room trimmed in gold leaf. It was like stepping into the scene from The Little Princess where Shirley Temple and her young friends awake to find a spread so sumptuous, so perfect, that they feel that have to have a taste of everything before it vanishes. The meal did disappear, thanks to our less-than demure appetites, and followed up the lavish meal by heading to the Four Seasons Spa for PorteÃ±o massages. 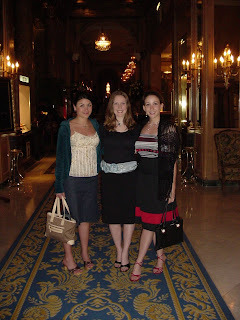 After being pampered so thoroughly, the girls and I decided to extend the princess fantasy by transferring to suite the Alvear Palace, a property so true its name, there was actually royalty in residence during our stay. We learned that we’d just missed Owen Wilson‘s visit, and that Antonio Banderas, Salma Hayek, Sharon Stone and Matt Damon, had all recently stayed here. 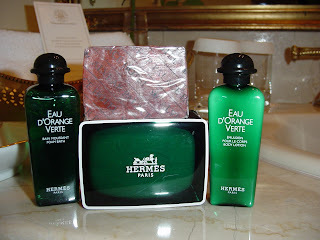 Despite missing a critical celeb sighting, we immediately brightened upon the discovery that our room came complete with Hermes bath products and a private butler to unpack and press our clothes. It was early the following morning at the lobby bar that I met my cappuccino companion Christian, who after meeting my friends, decided to call two of his and arrange a whirlwind tour of the city. Thrilled at the prospect of getting an insider’s view at Buenos Aires, we accepted the invitation. At around 10:00 that night we met Christian and his pals Ignaco and Alan at a café not far from our hotel. From there we headed to Prime bar, a sleek space bathed in ambient pink light and trimmed with cool metals like aluminum and chrome. Ignacio, who was the spitting image of Paul Bettany with the soul of Vince Vaughn, immediately presented himself and the charming instigator of the group. Alan, with his tousled hair and lean, muscular frame could have been an Abercrombie model, but sadly, he was a mere babe at only 23 years old. And Christian, for all his sophisticated confidence that morning, had transformed into “one of the boys” in the presence of his friends. I guess some things never change, no matter what hemisphere you’re standing in. With a full bar, extensive wine list and delicious tapas menu, Prime proved to be an ideal spot to get acquainted, and by the second round of tragos, or cocktails, language barriers had already come crashing down. Between the three of us, Holly, Jen and I knew enough Spanish to translate what the boys were saying, and no matter how fast we talked, they understood exactly what we were saying about them. Fortunately, the reviews were positive on both sides. We quickly learned that the guys were obsessed with Americans, especially women: they wanted to know about our culture, the way we did things, what we complained about, what we liked, and of course, our politics. They wanted to know why we’d elected George Bush into office (as if the girls and I were personally responsible for the vote, and the term “blue state” didn’t really translate). 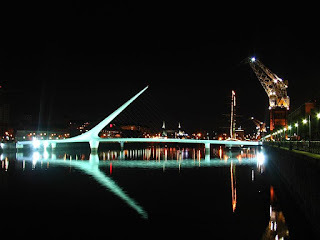 But the sincere the devotion to deciphering us was endearing, rather than off-putting, and we all decided to continue the night by barhopping in Puerto Madero. Once a derelict warehouse district in the “bad” part of town, the old portt area had been completely revitalized to reveal a waterfront complex housing brand new lofts, hotels (including the 85-room Phillip Stark designed Faena Hotel & Universe), and dozens of trendy restaurants and shops. The port stretches nearly a mile, far too long for our group to hit all four sections, but we make a valiant effort to raise a toast in as many spots as possible. When we finally emerge under a nearly full moon, I can make out the sylphlike white apparition of the Puente de la Mujer, or Bridge of the Woman, stretching over the water. Christian tells me that its dramatic form was designed evoke images of a couple dancing the tango, the man towering over the woman who leans back horizontally. 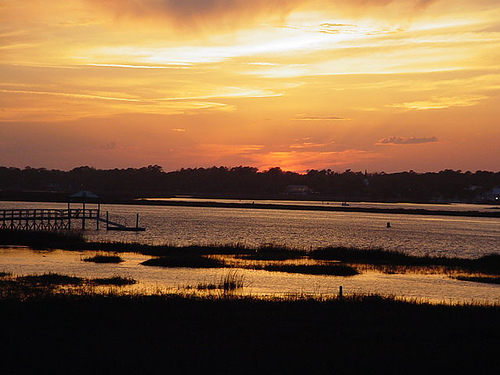 I’m suddenly compelled to check out the view from the middle, and Christian and I abandon our friends to make the trip. A little unsteady on the wooden walkway, I try not to loose a high heal in the groove between the planks. Fortunately, Christian seems on the ready to catch me if I fall. As we approach center of the bridge, I’m vaguely aware that Christian is murmuring something romantic about the water and the stars, first in English, and then in Spanish. I start to tune in and realize that he’s taking his role as a Latin lover just a bit too seriously. Suddenly the whole scenario-the bridge, the boy and the starlight sky-feels and little too surreal, as if somehow the whole thing had been scripted just for me. Immersing myself in culture is one thing; getting entangled in it is another. I coax Christian back down the bridge (before he gets too carried away and proposes) and rejoin my friends at the bottom. 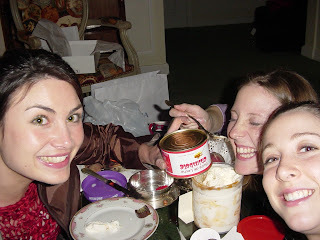 After saying our goodbyes and exchanging emails, the girls and I return to our hotel and order up vanilla ice cream topped with dulce de leche. As we sit with a big bowl between us, three silver spoons dipping into the rapidly melting concoction, we recount the events our night, and come to one firm conclusion. Finding romance in a foreign land may sound sweet, but sharing the adventure and dessert with your best friends is even sweeter. I always try to explain the red state/blue state thing….never works…. Very nice blog. Lets visit mine. hey girls when are you goin to the Philippines? Welcome to Argentina! Is a beatifull country. You must taste the “Dulce de leche” icecream from Fredo. Enjoy! I really don’t agree with this particular post. Nevertheless, I did searched with Bing and I’ve found out that you’re right and I was thinking in the wrong way. Keep on publishing high quality content such as this.